I did not sleep too well that night. Pomi had been right after all. There had been too much of everything in that salad. Definitely too much salt. I had been up almost all night drinking what seemed like gallons of water. First thing in the morning I went up to the roof to get some fresh air. 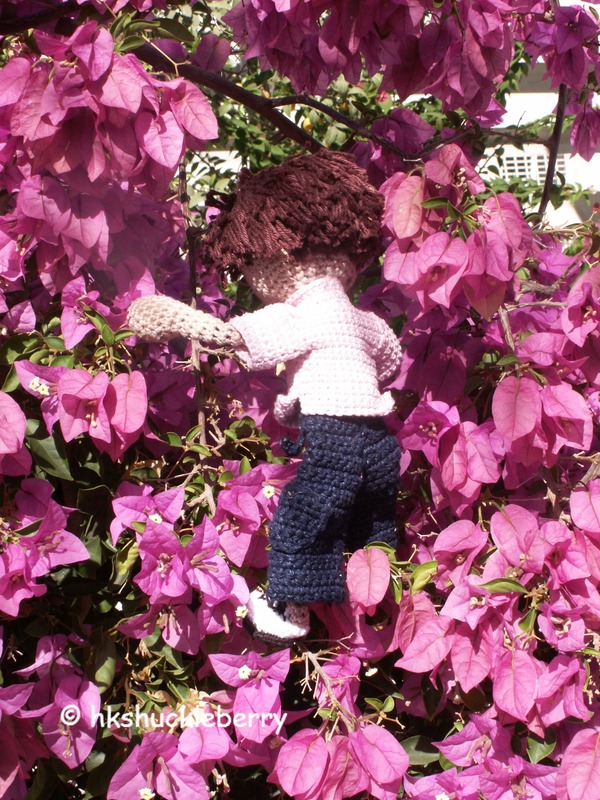 I can’t say I was too surprised to see Pomi there but what was he doing scrambling about in my Bougainvillea? He was so absorbed in whatever it was that he was doing that he did not notice me. From the Bougainvillea he hurried to the Hibiscus bush grabbed a branch and began to climb. 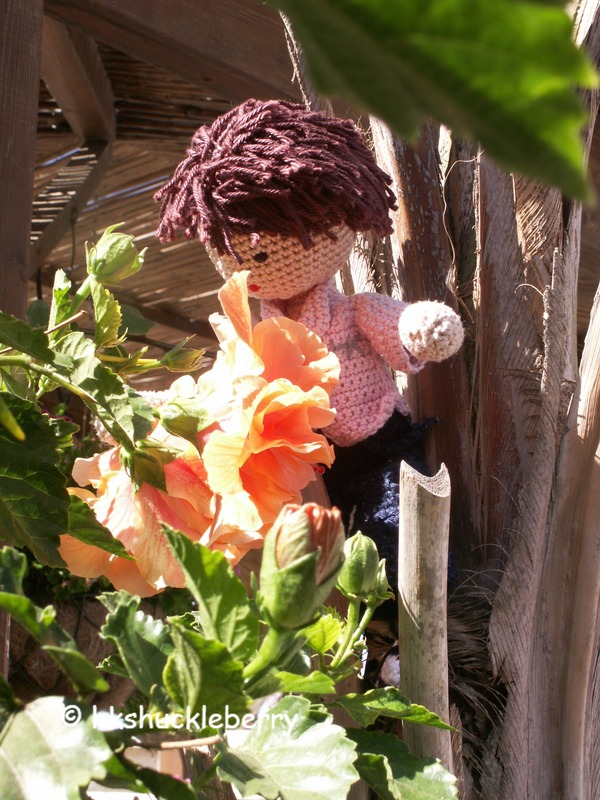 I was holding my breath while Pomi climbed all the way up the Hibiscus pausing at each flower to examine it. Then he moved on to the next until after having looked at one flower for a long time he grabbed it and broke the stem. Holding the flower in one hand and with the other clinging to a branch Pomi looked towards the ground apparently contemplating the way down. That was when he saw me. He looked more than disappointed. ” The surprise?” I held out my hand and Pomi jumped landing lightly on my outstretched palm. ” Yes! This!” He held the flower he had just picked off the Hibiscus bush out to me. ” Very pretty! What a lovely surprise.” I looked into Pomi’s cute little face. 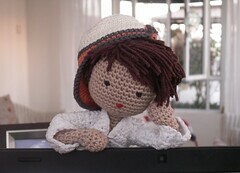 ” Not much of a surprise now.” My crocheted climber replied still looking rather unhappy. ” Can you put me down?” he asked. I bent down and Pomi jumped off the palm of my hand to the floor. Flower in hand he ran towards my workroom. 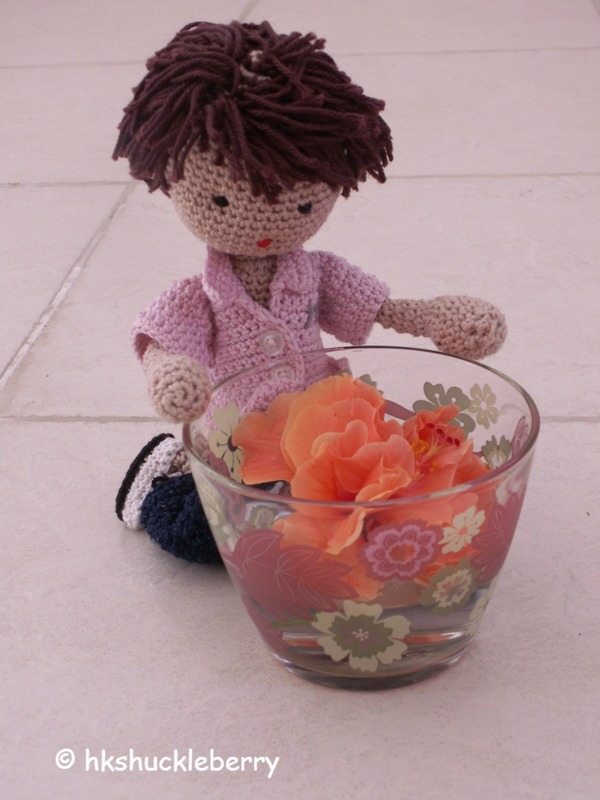 There the glass of water that I always keep on my desk was somehow sitting on the floor and Pomi knelt down and placed the flower in the water. 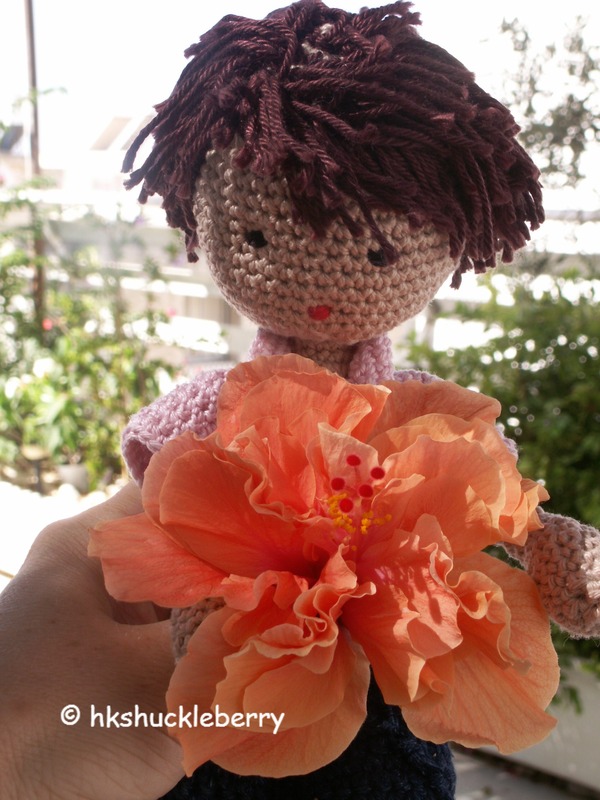 ” How beautiful!” I knelt down next to Pomi and admired the orange coloured blossom. ” I heard you rummaging about. I did warn you though.” And there he smiled again. ” I am glad you like it! But I am hungry now. Can you make me some salad ?” He grinned . Oh Heike, I LOVE Pomi and his ideas … what a pleasure to read of his adventures! Ja, ein ein Blumenkavalier, das Wort hatte ich ja schon fast vergessen. Such a sweet story! Love the “illustrations”.